After my colleague Arno Luecker has begun his analysis project of every single bar op.111 on this blog it is only fitting that we talk about another monumental project involving the name of Beethoven. This one has been initiated by Susanne Kessel, a very industrious and active pianist from the city of Bonn, who has already created countless fascinating projects with a variety of composers. 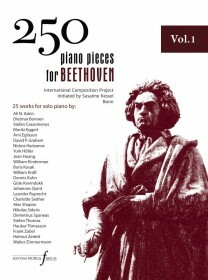 But this time she has created something like the Mount Everest of all homage projects: “250 piano pieces for Beethoven”. In the year 2020 Beethoven will celebrate his 250th birthday, and that was reason enough for Kessel to start this undertaking that will involve not only the commission of 250 pieces to 250 different composers from all around the world, but also her complete dedication to continuously perform and record these pieces during the upcoming years and to also oversee their publication. The first volume has just now been published. It is the first of 10 planned lavish editions each featuring 25 pieces. The most surprising thing about the edition is the sheer diversity of composers. So you find somebody like Helmut Zerlett (long-time musical companion to famous German talk-show host Harald Schmidt) next to German Avantgarde grand master York Höller, Turkish film composer Ali N. Askin next to experimental composer Walter Zimmermann. Many of the composers are instrumentalists themselves (like Dennis Kuhn, founder of the Mannheimer Schlagwerk ensemble) or William Kraft, also a percussionist and well-known American composer. The edition has been made possible by countless individual donations and the editorial work of Greek composer Nikolas Sideris (who also has a composition in this volume). It’s printed on high quality-paper, and is a lot of fun to read and play. The pieces range from simple to hefty regarding difficulty, and there is a wide range of performance practices, inside piano playing, theatrical elements, improvisation, etc. All the pieces refer to Beethoven, in very different manners. Some use quotes of his music, some even concentrate on a single chord (like Johannes Quint), others are more freeform homages. But the most fascinating thing about the project is the fact that at some point in 2020 we will have a truly unique and world-encompassing compendium of 21st century piano music from all ranges of style and musical approach. And that alone makes the project highly notable, even without the connection to Beethoven (which will assure public interest). The workload behind the project is humungous – even at this moment Susanne Kessel is approaching new composers for the project and playing concerts with already existing pieces tirelessly, while Nikolas Sideris is preparing the next editions by converting dozens of different music formats for printing and overseeing their editing.